The approach to this salad was inspired by my recent lunch at Beefsteak. The star ingredient is the sugar snap peas, which I boiled briefly (about 3 minutes) to make them crisp tender, in a similar manner to how Beefsteak cooks its vegetables. 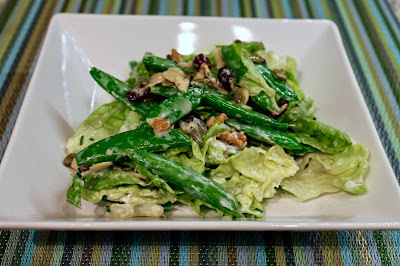 I then rinsed the peas in cold water before adding them to a salad of Boston lettuce, along with crunchy toasted almonds, toasted walnuts and pepitas. 1. Bring a medium pot of salted water to boil. Add sugar snap peas and cook until tender-crisp, about 3 minutes. Drain and rinse under cold water until cool. 2. Heat a small frying pan over medium-low heat. Toast almonds and walnuts until lightly browned and fragrant, about 5-8 minutes. Set aside to cool. 3. Combine lettuce, cooked sugar snap peas, toasted nuts, pepitas, cranberries, goat cheese and chives in a large bowl. Whisk together vinegar, honey and mustard, then add the olive oil and whisk until emulsified. Add to the salad and season with freshly ground black pepper toss until well combined and the goat cheese has mixed in with the dressing.